Well hello there. I guess I have some explaining to do about where I’ve been and why I’ve been neglecting this blog. To get straight to the point, I found out in September that we are expecting a new little Lueckemeyer. Shortly after that, intense, crippling morning all day sickness set in, and has out welcomed its stay for the past 3 months. Being sick has become such a routine occurrence that when I have had to excuse myself, my son will kindly be sure to inform anyone around, “Mommy plaaah..” I am still struggling a bit, but it is getting much more manageable now. Needless to say, it was pretty tough to bring myself to think, much less write about food that I so wanted to love to eat, but just wouldn’t love me back. That, and every spare moment I have had between work, running a business, and raising a rambunctious toddler I have spent flat-on-my-face exhausted. Hopefully from now on less “Mommy plaahs” are in my future. But enough whining already. I am so excited and blessed to announce my sweet Matthew will get a little sister (and our family a future little ballerina) in May. I am trying not to go crazy with tutus and pink, but for those of you who know me well, I can see the “uh-huh, good luck with that..” look on your faces through this computer screen. So here’s back to enjoying food and back to sharing nourishing recipes with you! 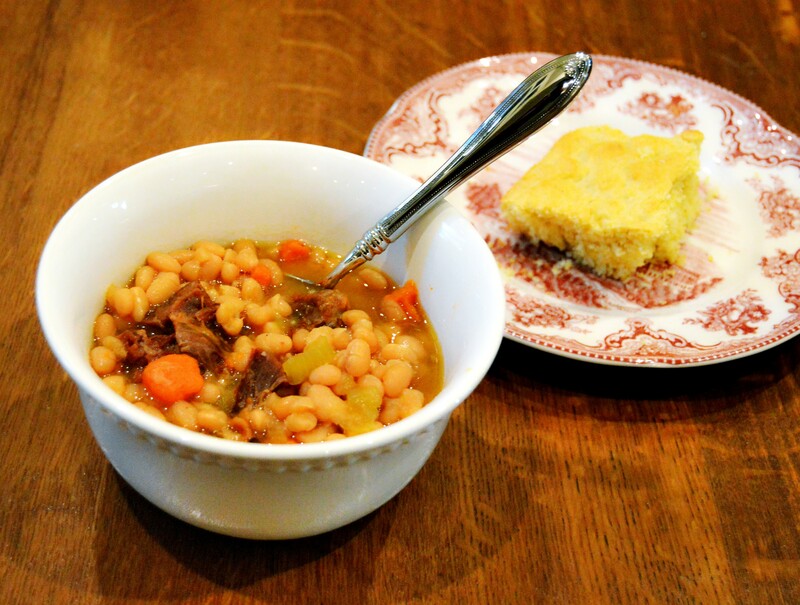 I have to share this Navy Bean (or Boston Bean, if you will) soup I whipped up this week that turned out amazing. It really hit the cozy, comfort-food spot with the cooler weather we finally have had, after it being in the upper 70s through Christmas and New Years. Another one pot, crock-pot meal which you just gotta love. So easy, so satisfying, yet so little to wash.
A little over $2 per 1 lb bag…that’s hard to beat for a meal that can serve 8..
Before I share, I will emphasize this recipe calls for dry Navy Beans, so be careful when shopping to avoid getting dry cannellini, which look similar. Cannellini beans are actually not recommended for slow, lower temp cooking. Why? Because cannellini beans contain higher levels of the lectin, phytohaemaggluttinin (say that 5 times fast, I dare ya) which is considered a toxin when consumed in high amounts. Raw beans have the highest concentration and ironically the toxin is released in even higher amounts in low-temp cooking, like in your crock-pot. This toxin can cause extremely unpleasant GI symptoms, including diarrhea, vomiting, abdominal pain and gas – cue “beans, beans the musical fruit..” song. More info can be found here. Red kidney beans have the highest level of this toxin, so be especially careful with them. These types of beans should be soaked for at least 5 hours and then boiled for at least 30 minutes to help reduce the toxin. Or buy canned beans to be safe. Now that I’ve scared you with bean poisoning, (I know, it’s like geez Elissa, don’t I have enough to worry about!?!) also know that Navy beans are as nutritious as they are satisfying. Rich in fiber and flavor, they have a low glycemic index and are full of folate (especially important for us pregnant folks) and magnesium. This also makes for a great source of vegetarian protein if you omit the ham. 1) Combine carrots, celery, onion, and garlic in the crock pot. Drizzle olive oil over the top. 2) Add soaked and drained navy beans, along with the chicken broth, water, and bay leaf. 3) Add ham if desired, sprinkle with pepper according to your taste. 4) Cook, covered, on high for 6 hours or low for about 8-10 hours. 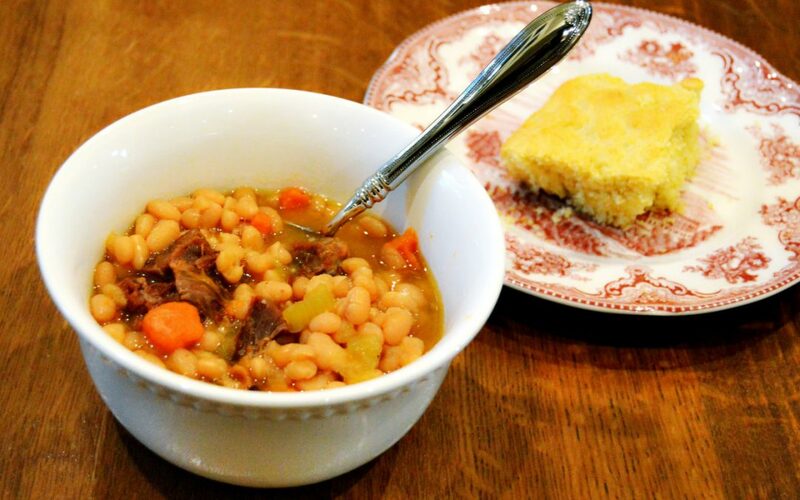 Fantastic served with warm corn bread. Cuddle up with a bowl and let me know what you think! Are you local to central Texas and are interested in learning proper portion control for diabetes management or weight loss? Check out my upcoming Carbohydrate Counting class schedule at www.food4success.com. This looks like such a warm comforting soup yum!! It was news to me too until just recently! First of all, congrats on expecting! Hope you’re feeling better. So interesting about the toxins in dry beans – i had no idea. This was a favorite in our house growing up, my dad’s favorite soup! Love your spin on this recipe, sounds so cozy! I love bean soups! Yours looks so delicious! !